A lean, mean, backstabbing machine. Known for PvP ownage, Sub also can do very well in PvE, you just have to be good at managing your finishers and energy. Nothing wrong with Shadowdancing a boss, ya know. Reforge to your Hit cap, then all else to Crit. If the weapon already has Crit and you’re Hit capped, then reforge to Haste. Note: If you dual spec and you’re not switch gear sets, then Haste is a good stat to reforge into. It’s at least a decent stat for all Rogues. Off: Leeching in PvE, Crippling in PvP. Gems and enchants can be expensive. Go here if you can’t afford them. Delicate Agility or Mystic Resilience gems only. Nothing else matters. MoP gems are much better than Cata counterparts. 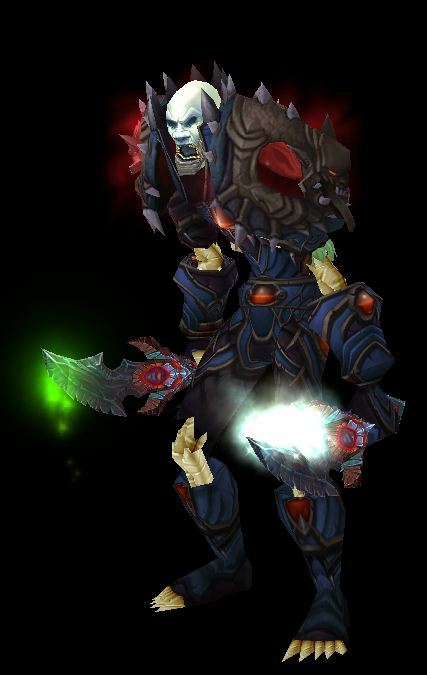 MoP enchants are much better than Cata counterparts. Pandarans can be Rogues, Draenei and Tauren are the only races that can’t. Pandaren: May join either Horde or Alliance, can stun with a touch, level faster (longer lasting rest XP,) increased benefits from food buffs, less falling damage, good with cooking. Night Elf: Quickness helps with survival, Shadowmeld can be used in combat to drop aggro or break incoming spells. Faster stealthy movement. Worgen: Sub loves Crit and Worgen get a 1% bonus to that stat. Good with Skinning, which adds to Crit rating. Sprint ability is quite useful. Gnome: Expertise with daggers is nice, small size really is useful in PvP, escape is nice. Good with Engineering and Synapse Springs is a nice Engie gadget to use. Human: Diplomacy is nice if you’re rep grinding, escape ability allows you to use two DPS trinkets in PvP. Dwarf: Stoneform washes away bleeds and reduces damage, Ranged expertise is next to useless. Undead: can remove effects, consume dead players, can drain health from enemies. Troll: Berserking, damage Vs beasts (Worgen don’t count,) reduction in movement impairing effects. Goblin: Rocket jump (breaks stealth) is a good escape, increased Haste, Good with Alchemy for an action bar full of potions. Most of the professions offer a net gain of about 80 Ag. points over the regular enchants or item enhancements. In Mists of Pandaria it will be about 320 Ag. Alchemy: Better effects and more duration from Chemisty. Figure an extra 320 Ag and and extra hour from your Flask of Spring Blossoms. Blacksmithing: Slot two extra Agility gems. Engineering: Useful gadgets, Synapse Springs adds a lot of Ag for 10 seconds on a one min cooldown. Inscription: Very nice shoulder enchant. Tailoring: Flying carpet and a cloak enchant that sometimes adds Attack Power. 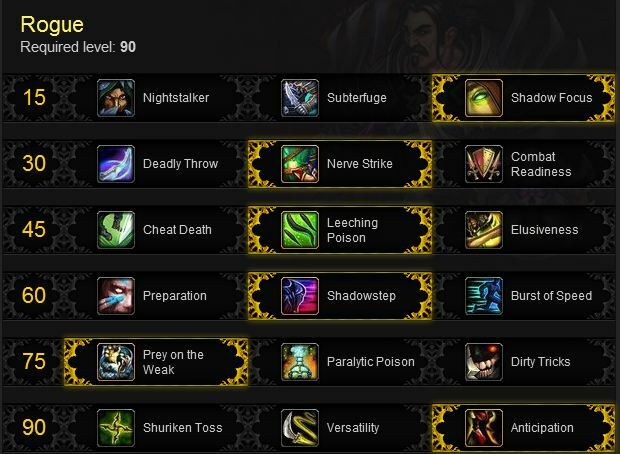 Any spec of Rogue can grab any one talent from each tier. This means six talents at level 90. This also means that any Rogue can take Shadowstep and that PvP Rogues cannot have both Shadowstep and Prep. 10 – Hemorrhage – adds a bleed in addition to the basic damage, replaces Sinister Strike. This is your “bread and butter” attack. 10 – Master of Subtlety – more damage (10% more) when attacking from stealth. 10 – Sinister Calling – increases total agility by 30%. Agility is already the #1 stat for all Rogues, this makes it even more true for Subtlety. 20 – Find Weakness – openers bypass 70% of opponent armor for ten seconds, giving you the chance to drop some serious damage. 30 – Premeditation – adds 2 combo points to target before your attack. 40 – Backstab – requires man hand dagger, must be behind target. This is great for dungeons, but is a bit tricky to use while leveling or in PvP. 50 – Honor Among Thieves – Gain combo points from the crits of party members. 60 – Sanguinary Vein – Improves Rupture and all bleeds. 70 – Energetic Recovery – Slice and Dice for faster energy recovery and more white damage. Have S&D up at all times. 80 – Shadow Dance – now 8 seconds (was 6, before M of P,) allows use of abilities out of stealth, such as cheap shot and extra ambushes. Shadow Focus – Abilities no longer cost Energy while you are stealthed. Sap to Cheap Shot to Vanish to Ambush to Shadowdance at zero energy cost. Nerve Strike – Opponents does less damage when coming out of Cheap Shot or Kidney Shot. Leeching Poison – your strikes heal you, but it means you won’t be using Crippling (or another) poison. Elusiveness will allow you to avoid a lot of burst damage, so might be more useful in some situations. Shadowstep – Teleport to target, friend or enemy, but no damage increase. Don’t open with it, use it to catch up with runners, disengagers, or blinkers. Prep has definite use if you use those CDs more than you need the mobility, and Burst of Speed also provides mobility and escapes and might be perfect for flag carrying. Prey on the Weak – When you disable an enemy with your stuns they suffer increased damage from all sources for the duration of the effect. This is a weak tier, but this talent can be useful with some coordination. Dirty Tricks has some definite PvP possibilities. Anticipation – Stores excess CPs on target and applies them after a finishing strike. Never again waste CPs. Versatility is great if you switch targets regularly.